Aren't these shoe favor boxes fabulous? Designed especially for Diva Entertains! 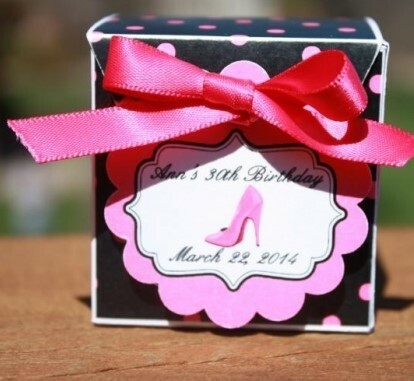 Perfect with a high heel birthday party theme, each stiletto favor box measures approximately 2 1/4" x 2 1/4". It can hold a generous amount of small candies, Lindt truffles, flower seeds, a fortune cookie, tea-light candles, etc. And it arrives fully assembled! 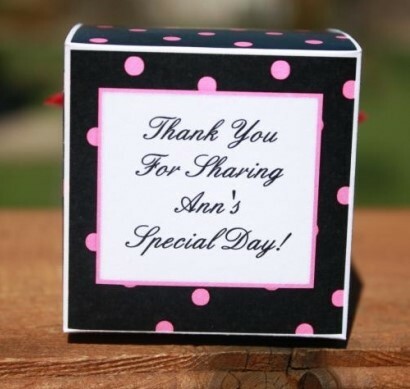 Our boxes are fully customizable - you pick the border color (front tag matches the border) and ribbon color. If you would like to add a photo to the front or back, please go to our "Contact Us" link and send us your image! The stiletto image is on both sides of the box and then we print the message of your choice on the front and back! Minimum order is 24 favors. Please allow us 7 business days to fulfill your order; add ship time.